Are you looking for the perfect adventure in Hawaii for your family? Look no further than our zipline tour in Oahu! At CLIMB Works Keana Farms, we offer an incredible zipline experience that’s both safe and enjoyable. 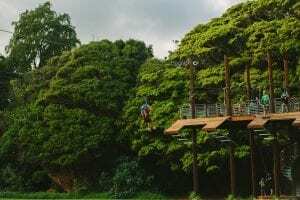 Here are 5 reasons our zipline tour in Oahu is great for families. Safety is our number one priority, and we know it’s yours too. At CLIMB Works, we follow and exceed all industry safety standards. Throughout the tour, you will always be safely secured, and our guides take care of all equipment transfers to hook you up to the zipline and other parts of the course. To increase our safety even more, we’ve eliminated hand-braking so our guests don’t have to handle the safety issue of speed regulation. You won’t have to worry about a thing except for enjoying the experience with each other! We have trained guides that accompany guests on each tour to make sure you stay safe and have a great time. Our guides have each gone through extensive safety training, and we require ongoing training to maintain a high level of safety. Our trainings include basic safety techniques and protocol to advanced rescue scenarios. Our guides will also keep you laughing and teach you more about Keana Farms and Hawaiian culture throughout the tour. They’re there to help you overcome any fears you might have! 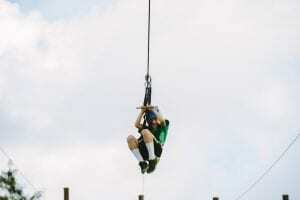 Our zipline tour in Oahu includes a number of educational opportunities as well. Not only will you get to see the breathtaking Hawaiian scenery, but you’ll get to learn about Keana Farms and Hawaiian history and culture! There are educational exhibits set up along the tour that change the way you look at Hawaii and show you how Hawaii has changed over the last few hundred years. You’ll also have the opportunity to explore the working farm and taste some of the fresh fruit — which the kids are sure to love! Our 3-hour guided zipline tour has Oahu’s longest ziplines, ranging from 500 feet to nearly half a mile long! They are designed so you can see the North Shore’s famous beaches, farms, and lush mountains. Because they are side-by-side, you get to ride with the person of your choice right next to you! Parents and children love getting to enjoy the views beside each other. Everything is more special when you share it with the people you love. 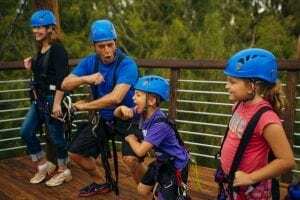 On our zipline tour, your family will create amazing memories you can share for years to come. We even take photos along the way for you to purchase after your tour so you can cherish the moment forever! It’s the perfect way for your family to bond and grow closer together. Book our zipline tour in Oahu today and get ready for an incredible adventure!